"It’s magical, protected; it backs right up to the Napa County Land Trust running alongside Simmons Creek. It’s a little more of a trek to come up-valley, but once I’m here, this is it, this is my world." 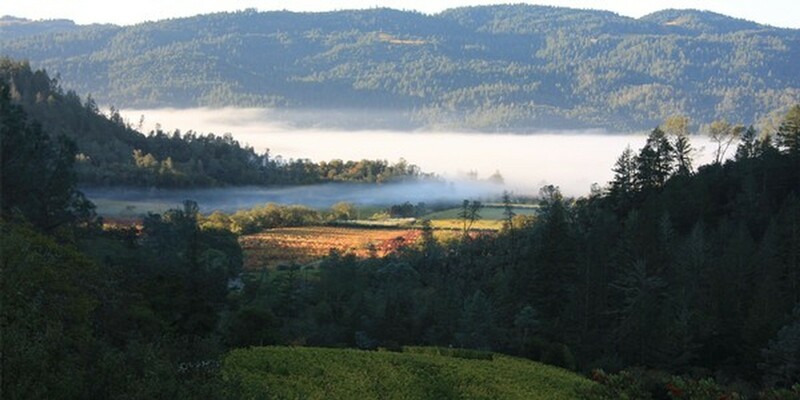 When Kelly Fleming purchased the 300-acre property in Calistoga that would become our winery’s home, the virgin land was unchartered territory. No grapes had ever been planted here, though the pedigree of neighboring vineyards, including the Eisele Vineyard, attested to the site’s potential. This is a warm area, with heat stored and reflected off the steep and rocky hillsides of the west-facing ravine. Yet the heat can be short-lived, as these same hillsides mean the sun rises later and sets earlier than on the valley floor. In summer, the temperature can swing as much as 50 degrees from day to night, allowing grapes to ripen fully, yet retain the acids that are crucial for elegance, structure and balance. In addition to grapes, our property is home to olive and fruit trees, flower and vegetable gardens, and an abundance of animals – both feral and tame.